Teach Students To Use Social Media (The Right Way) And The Possibilities Are Endless : NPR Ed Social media can be a big part of students' lives, and teachers across the country are finding ways to use popular platforms as teaching tools. CJ Marple wanted to teach his young students how quickly information can spread on the Internet. So earlier this year, the third-grade science teacher wrote up a tweet with the help of his students, asking for other users to retweet the message, or even reply to the message with their location. The Kansas teacher says he expected 1,000 or so retweets, but within days the tweet went viral and gained more than 227,000 retweets and 75,000 replies from users all over the world. His students, who are probably a little too young for their own social media accounts, learned a lot that week about the power of social media. If used right, Marple says, "The possibilities are endless." 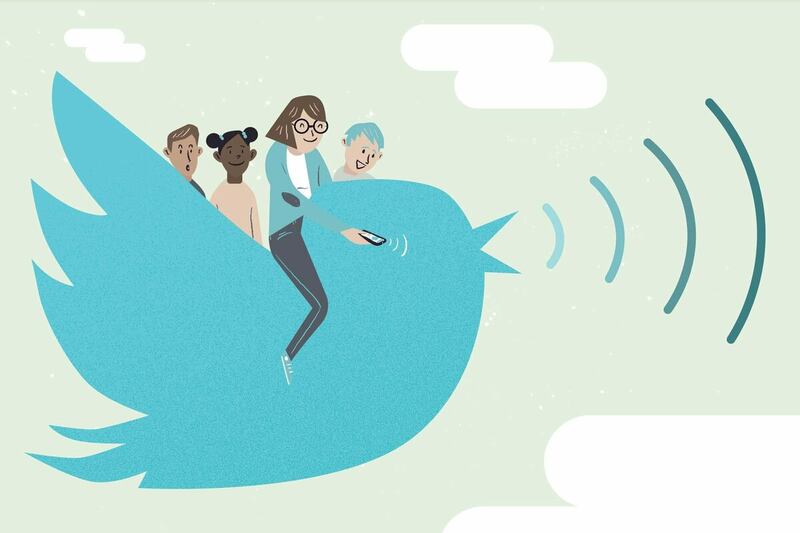 Teachers have taken to creating Twitter accounts for their classrooms, which they use to post assignments and as a forum for students to tweet questions or thoughts on a specific lesson. But while introducing social media can help learning, some states have gone as far as issuing guidelines for teachers to keep social media interactions between students and teachers appropriate. "In recognition of the public and pervasive nature of social media communications, as well as the fact that in this digital era, the lines between professional and personal endeavors are sometimes blurred ... Professional social media sites that are school-based should be designed to address reasonable instructional, educational, or extra-curricular program matters." And that blurred line is the reason high school teacher Bayly DiPilato stayed away from interacting with students on Facebook. She says she felt it was too personal. DiPilato, an English teacher in New Jersey, opted for using Twitter because she can use a specific hashtag for each of her classes and has created a public archive for her students using that hashtag. "It's been this great way to quickly share information and model a way for Twitter to be used in a healthy way," says DiPilato. She says her students have school email accounts where teachers can send announcements or homework, but she posts classroom notes and homework assignments on her Twitter account instead. "Kids check their Twitter more than their school email," she says. In addition to keeping her class up-to-date with assignments through Twitter, she is constantly retweeting articles that are relevant to their English class in the hopes of teaching her students how to use Twitter personally and professionally.